Many of us gaze in wonderment at a star-filled sky but not many of us get an opportunity to ‘count our lucky stars’! Two ladies who are taking star-gazing to a whole new level are astrophysicists Professor Lorraine Hanlon and Dr. Sheila McBreen founders of Irish company Parameter Space Limited. Parameter Space Limited, headed by Lorraine and Sheila, is a spin-out from the UCD School of Physics. They established the company following completion of the 5-week 2014 UCD Commercialisation Bootcamp held at NovaUCD. The good news is that the company has recently secured a €800,000 contract from the European Space Agency (ESA) to fund a 3-year project. Parameter Space will develop a portal to host analysis algorithms provided by the scientific community and develop specific tools for enhanced analysis and access to this data. The new software developed will be capable of exploiting the unprecedented volume of data returning to Earth from ESA’s Gaia satellite, which was launched in late 2013. 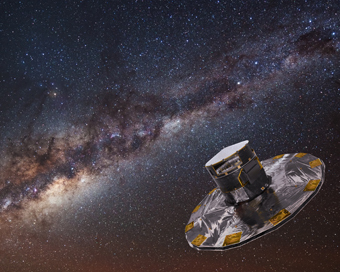 To put this into context, the main goals of this €700 million mission are to measure the precise positions and luminosity of 1 billion stars and to discover thousands of planets around other stars and supernovae. Since July 2014 Gaia has made nearly 100 billion measurements with its 1-billion pixel digital camera. Gaia’s database will eventually grow to 1 Petabyte in size, which is equivalent to about 200,000 DVDs worth of data. Analysis of this data will result in the creation of a three-dimensional map of the Milky Way galaxy! Professor Hanlon and Dr. McBreen lead the UCD Space Science and Advanced Materials group and together have over 30 years of experience working on space missions, including ESA’s INTEGRAL mission and NASA’s Fermi Gamma-ray Space Telescope. The contract will also allow the company to create 4 new jobs.